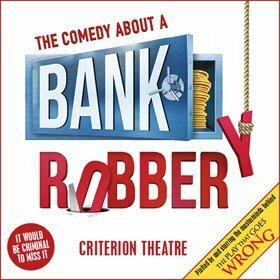 The Comedy about a Bank Robbery offers both existing fans and first-timers the opportunity to enjoy the Mischief Theatre genius, and it’s a chance not to be missed. This company’s meteoric rise to award-winning West End glory is not only thoroughly deserved; if there’s any justice, it’s also far from over. It came across to me as the latest in a long line of British farces, and it’s a sufficiently enjoyable couple of hours. The timing, as is required for a British farce of this kind, is impeccable down to the half-second. As ever with Mischief Theatre the primary objective appears to be to provide light entertainment rather than to give its audiences deep and meaningful storylines. There are elements of the plot that are never properly explored or explained, but the show is best enjoyed by overlooking the shortcomings in the narrative, and going with the flow.